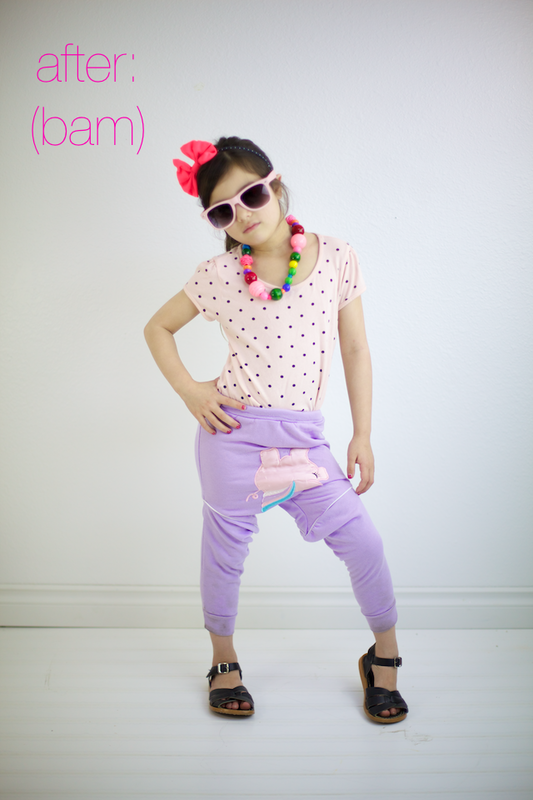 Happy Day (11&12&)13: Put on Your Trendy Pants! 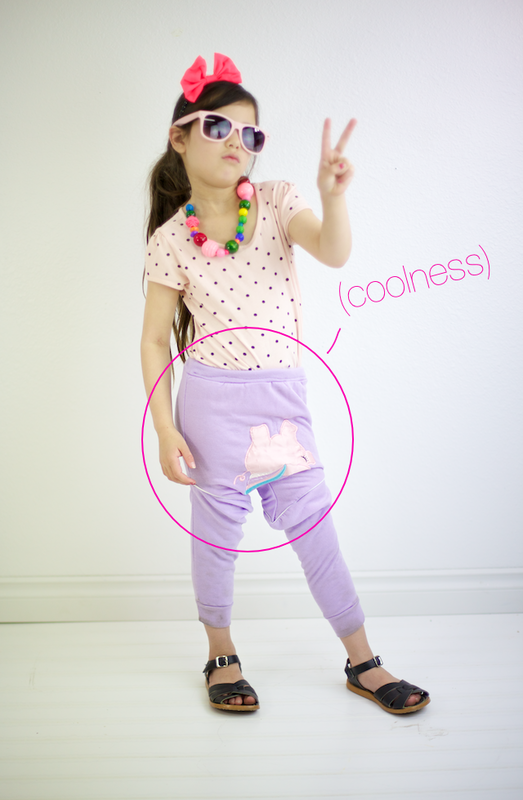 Ever wanted to live through your offspring and make sure they are the "cool kids"? Well I've got your back because today I'm showing you how to diy your way into one of the hottest trends in little wear: the drop crotch pant! 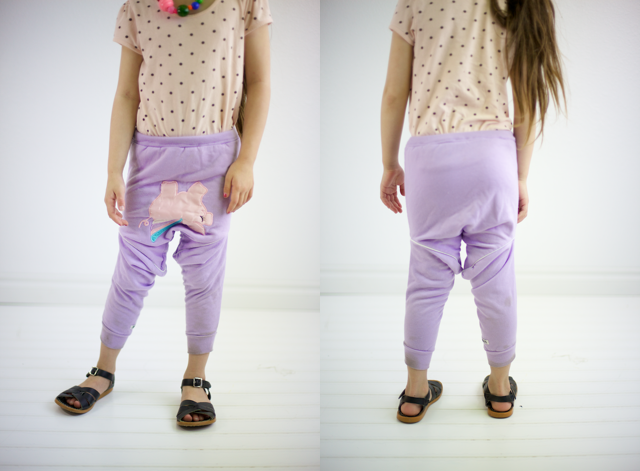 No sir, no need to change your toddler's diaper after 16 hours of wear, the drop crotch pant can hide your parental laziness! No one will ever know if it's a pile of pee, or a pile of coolness. And the best part? You can make yours using an old sweater! In only four easy steps! 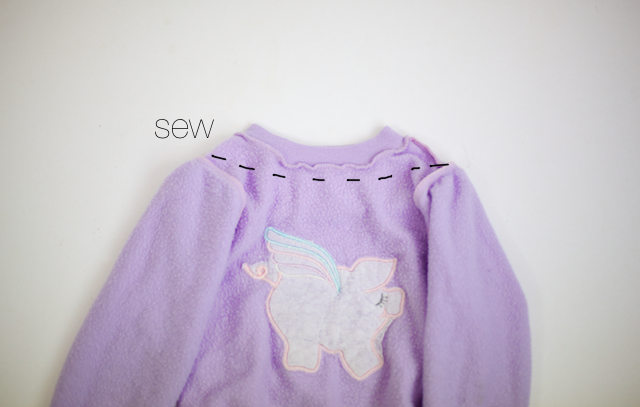 First: turn the sweater inside out and sew the neckline closed. No need to trim the excess because the more bulk, the more "bam!" 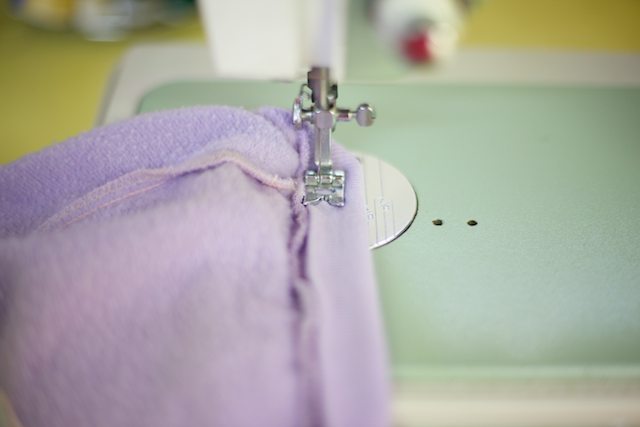 Then, turn over the waistband and sew closed, leaving a small opening to insert elastic. Use a safety pin to scoot the elastic through. 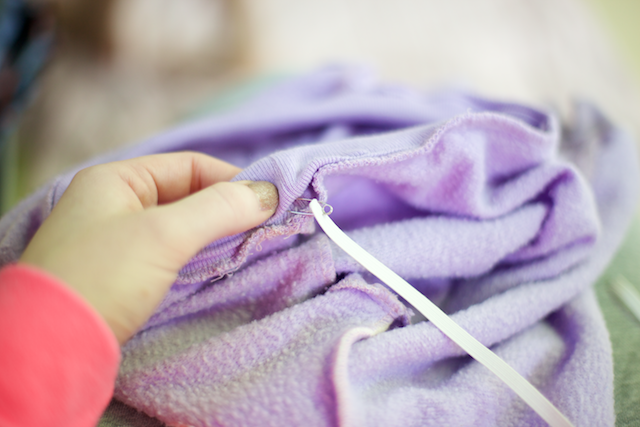 And sew the ends together, measuring around your child's waist to be sure it will fit. Now it's time to rock your pants in public and enjoy the jealousy from all onlookers. Have a happy day!! Stick around next week for our next tutorial: "the unisex party dress"
Super cool! Love the upside-down piggie! You and your accomplice got me good! Hilarious and brilliant. Haha love it! The 'pile of pee or pile of coolness' bit made me laugh out loud. Gosh you are the best! OMG! You definitely got me!!! Hilarious! LOL I was thinking there is no way, but it's so late I forgot about April Fool's Day. You are the only one who got me! Ha ha I thought you were serious, Disney. I was thinking to myself that I hoped that fashion didn't spread from the US to Australia. I have read a couple of US blogs that have tricked me. Oh thank goodness. I was so concerned about this!! Oh but Paige totally pulls it off! How cool is she?! Too funny! "the more bulk, the more "bam!" may be the best thing I've ever read on a blog . at the beginning I read a serious lady speaking of refashioning. then I thought "uhm...maybe she did not sleep well..." , then again "...ok...maybe it's because i'm italian and we are not into that kind of pants.."
Ok this is hilarious. The whole time I'm reading this I'm thinking, hmm maybe they'd look better if the pig was on the bum. Probably the best April Fools blog ever!! I totally missed this on the day of, but oh dear! 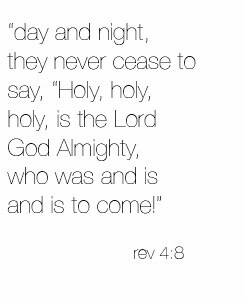 What a great one! 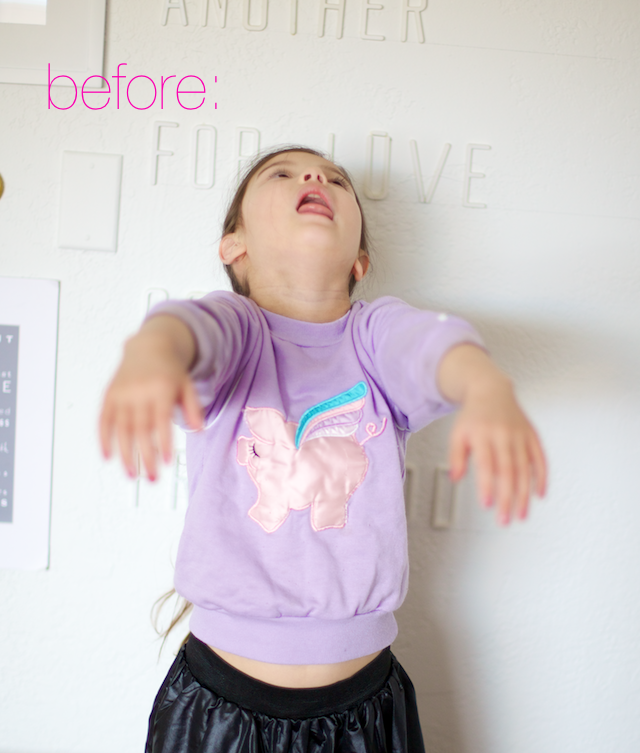 I love how you said that it wouldn't matter if you changed your kid's diaper....hahaha oh dear! I love it!